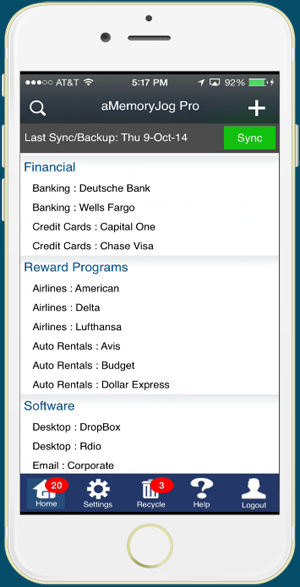 The aMemoryJog iPhone password management app securely stores all your passwords and private information (accounts, credit cards, frequent flyer information, loyalty cards and more). Organize your personal information with easy-to-setup categories, custom fields and unlimited notes. Quickly find items by tapping the Search icon. Restore deleted items from the Recycle Bin. Safeguard your information with our 256-bit AES encryption. If your phone is lost or stolen, you can trigger it to self-destruct, erasing all of your aMemoryJog information from the device while keeping the information securely in the cloud. Once your phone is found or you purchase a new phone, you can restore the information on the device from the cloud. Keeping track of all your personal information can be tricky. You probably have accounts, credit cards, loyalty cards, Wi-Fi codes, network passwords, website logins, frequent flyer cards and more. If that information is not neatly organized, you can easily lose track of it. If you own an iPhone, there is an easy way to keep track of all of this information. The aMemoryJog password manager app does just that -- it organizes all of your personal information, secures it, and puts it all at your fingertips. And when you are away from your phone, you can use aMemoryJog's web edition to quick access the same information but from your web browser. Watch the 2 minute video that illustrates how it works. With easy-to-setup categories and sub-categories, you take control over how your personal information is organized. You can create custom fields that tracks personalized tidbits of information. When creating passwords for websites and software, it is often hard to think of a strong password. aMemoryJog's password generator can create passwords in varying sizes that contain letters, numbers and upper/lower case letters. With unlimited notes, you can be as verbose as you desire. If you delete an item by mistake, simply restore it from your Recycle Bin. Your information is stored with 256-bit AES encryption. This is the same level of encryption most banks use. This ensures that your personal information stays safe and secure. 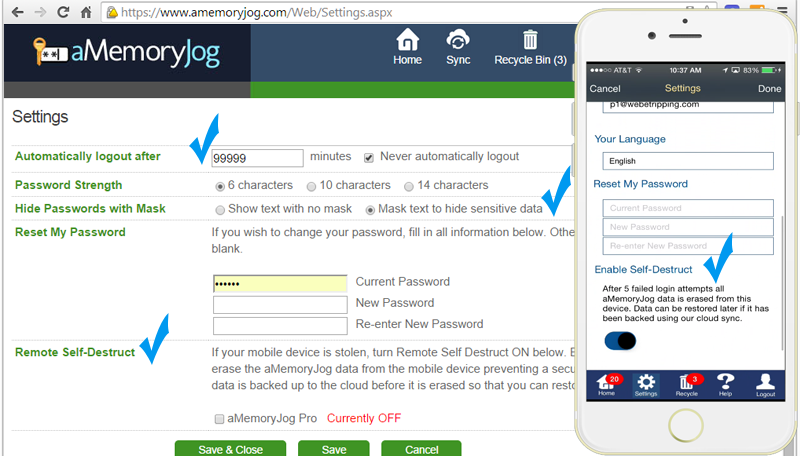 If your phone is lost or stolen, aMemoryJog's Remote Self-Destruct feature automatically erases all the personal information you put into aMemoryJog if a stranger tries to log into your account. Before erasing it, it backs the information up to the cloud so that once you find or replace your phone, you can simply restore it and not lose any of that information. The aMemoryJog Password Manager app has configurable settings to aid in better security. You can tell it to mask all passwords so that if someone's looking over your shoulder, they will only see asterisks (****) instead of your stored password. 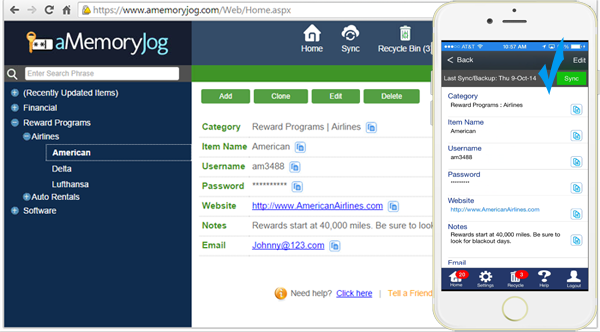 When using aMemoryJog, you can specify how often to keep the app open before having it automatically log out. That way if you put your phone down and walk away, it can automatically log out of the app when a certain amount of time expires. It is important to backup all of your personal information so that if your phone is stolen or stops working, you can restore from the backup. aMemoryJog allows you to automatically back the information up each time an item is updated. aMemoryJog also has a web edition that allows you to access your information with a web browser. You can do that from your PC, Mac, tablet, or any other device that is connected to the internet. As information is changed on your iPhone or in the Web edition, they seamlessly sync with each other. English not your native language? No worries -- we support English, Chinese, French, German, Italian, Japanese, Russian, and Spanish. Why wait? Get started now -- it's FREE! Download the free iPhone App Now.